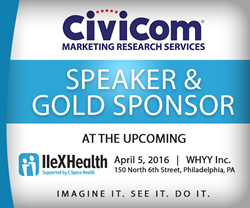 Civicom Marketing Research Services, one of the world’s leading marketing research service providers, is a Gold Sponsor and speaker at Insight Innovation Exchange (IIeX) Health 2016 on April 5th at the WHYY center in Philadelphia. At IIeX Health 2016, Civicom will extend its expertise and solutions that can be leveraged in facilitating healthcare research. Civicom will join leading health insight professionals in support of new thinking and emerging wellness, medical and pharmaceutical health insight discovery methods, bringing forth its expertise and suite of tools and solutions that can be leveraged for healthcare research. As a leading provider of web-enabled marketing research support worldwide, Civicom advocates only the most effective methods in ensuring privacy and information security both in the U.S. and across international borders. Rebecca West, Global VP of Civicom Marketing Research Services, will speak on “Achieving Teamwork in Data Security Protection” in IIeX Health 2016, addressing critical points such as privacy management between a research firm and a solutions provider. Civicom’s presentation will tackle the issues marketing researchers now face in meeting PII protection obligations. The discussion will cover methods that can be applied in support of technology provider and research firm partnerships when navigating sensitive respondent data issues, and various intricacies in data security protection especially now that the new EU-US privacy shield is moving into place. Insight Innovation eXchange (IIeX) is a global conference series which is part of the Insight Innovation platform, brought to the marketplace by industry information leader GreenBook. IIeX is singularly focused on advancing the business value of insights. It showcases the very best from inside and outside the market research realm with a focus on technology innovation, thought leadership, collaboration and networking. IIeX Health features TED-style presentations and panels on the future of healthcare insights, innovations in disruptive healthcare technology and how others are successfully leveraging emerging research methods. Civicom Marketing Research Services is a global innovator in qualitative research tools using the latest technology solutions for marketing research. The company works hand in hand with market research firms, facilitating telephone and web-based IDIs and focus groups that enable projects to have extensive global reach. Civicom Marketing Research Services offers many options to enhance the research process for marketing research professionals. Civicom is the global leader in facilitating telephone and web-enabled IDIs and Focus Groups using Civicom CyberFacility®. Civicom also offers Civicom Chatterbox®, an asynchronous research platform for online communities and bulletin boards, plus Civicom InSitu® Mobile Research, a qualitative tool for shopper insights, audio diaries and patient journeys. Civicom operates in over 96 countries and offers extensive translation services for marketing researchers, as well as transcription services through TranscriptionWing™, and respondent recruiting through CiviSelect™. All of these services are available in Spanish, as well as English, and multiple other languages. Civicom Marketing Research Services chooses to be as dynamic as it is innovative; always listening to and acting on clients’ ideas and requests as they see fit. This kind of relationship has paved the way for the development and rollout of new services.